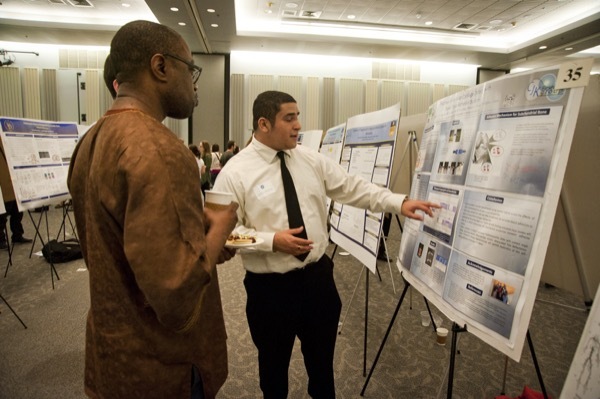 Jonathan Galarraga (right), a chemical and biomolecular engineering major and McNair Scholar, explains the research he is doing on bone adhesives to McNair coordinator Matthias Seisay. 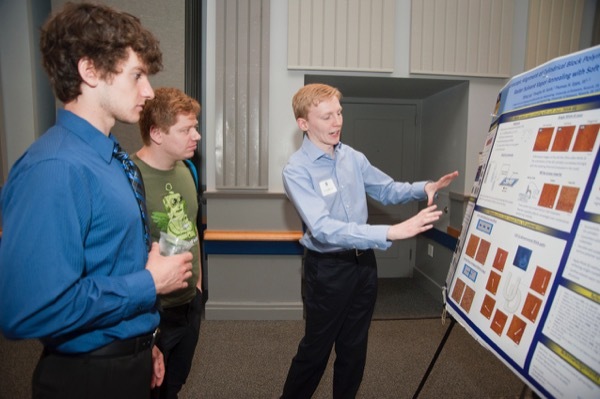 UD students (from left) Dakota Rawlings and Alex Northrop listen as Douglas Scott explains his research in polymer films. Environmental engineering student Katelyn Scatari talks about her research on greenhouse gas emissions from floodplain sediments. Daniel Charytonowicz, a biomedical engineering student, has been studying how the brain responds to rapidly changing images. 10:08 a.m., May 5, 2015--When a student moves into research, there's a lot to learn – and not all of that learning comes from reading, writing or laboratories. For example, where do you go to get bone samples? Jonathan Galarraga, a McNair Scholar at the University of Delaware, faced that challenge and said he felt a little like the proverbial "mad scientist" at first. He needed the samples for his work in the lab of Christopher Kloxin, assistant professor of materials science and chemical and biomolecular engineering. Galarraga wanted to test a new bone adhesive for their work on treatment of cartilage defects. He made a somewhat timid call to Herman's Quality Meats on Cleveland Avenue, expecting them to be surprised by this odd request. Instead, the person who answered the phone simply asked when he was coming. The parts were in stock. What he did with those cow bones was part of Galarraga's presentation at the Undergraduate Research Summer Scholars Poster Session that drew more than 100 students to the Trabant University Center last month. 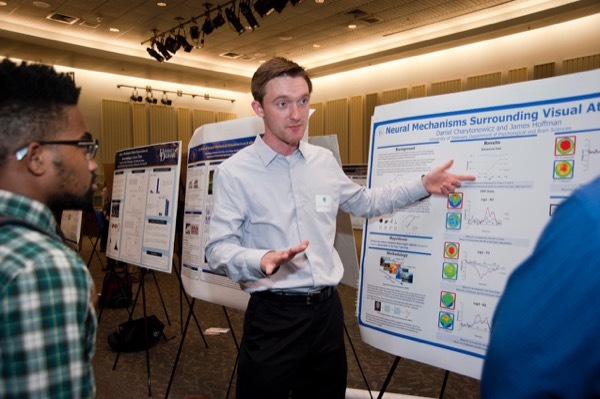 Most were part of the Summer Scholars program that offers undergraduates a 10-week summer job with a faculty researcher, giving them the chance to experience the work, learn research protocols and develop questions and ideas for senior theses. Douglas Scott, a chemical and biomolecular engineering major, worked on aligning polymer films with Thomas H. Epps, III, the Thomas and Kipp Gutshall Chair of Chemical and Biomolecular Engineering. And that opened a whole network of other resources, Scott said. "He knows all these people at all these different universities," Scott said. "Why don't you check what so-and-so has done? And if you contact them, they give you all kinds of ideas." Those connections with faculty and other researchers are invaluable, said Matthew Kinservik, vice provost for faculty affairs. And UD's commitment to both high-level research and great teaching is a significant plus for students, he said. Kinservik recalled what his adviser told him when he was starting doctoral studies at another school: "You're welcome to join me if you want to be a publishing scholar. But if all you want to do is teach and walk your dog you can go somewhere else." UD has found a "sweet spot" that offers the best of both worlds, Kinservik said. It is large enough to draw the best faculty and do high-level research, and small enough that students don't get lost in the shuffle. "We have had a robust undergraduate research program for decades," he said. "Every school has it now, but not every school has the resources we have. This is a research institution, but we will not tolerate bad teaching or ignoring undergraduates." Undergraduates are included in all kinds of investigations that could lead to better strategies for addressing cholera, breast cancer, immune system disorders, poultry health, cow health, oyster health, memory challenges, physical therapy, climate change, Parkinson's disease, post-traumatic stress disorder, electric cars, computer security, video processing, stormwater management, teaching math and learning disabilities. And that's just a sample. Among those browsing the poster displays were students, faculty mentors and other interested parties, including Jayme Arthurs, a resource conservationist with the U.S. Department of Agriculture. Arthurs said he was there mostly because of his work with the Water Resources Agency, housed in the Institute for Public Administration in UD’s School of Public Policy and Administration, but also wanted to see what else was happening in University labs. While his focus is on soil and water, he is interested in anything that helps farmers and growers with production, including livestock and crops. "You never know what you might find or see or who you might run into," said Arthurs, who is a 1999 UD graduate. Galarraga said his work on Kloxin's team has given him a richer understanding of how synthetic materials could contribute to successful treatment for osteoarthritis, a condition that affects about 30 million people in the United States alone. He is exploring defects in cartilage and how to address the cavities that undermine that joint-cushioning material. Already, he has some of Kloxin's keen ability to find analogies that help others understand the highly technical work. "Filling this [cavity] is almost like filling a pothole," Galarraga said, "removing the adjacent tissue and putting in adhesive." The new adhesive he is working with required testing to be sure it worked and didn't make things worse. "In research, there are many challenges along the way," he said. "We showed that the adhesive works almost a year ago. Now we're just trying to prove that." Eric Loverro, a biological sciences major, got some unexpected answers while doing research on the virus that causes Marek's disease. For one thing, he learned that he did not want to pursue biology research. Instead, he is considering going to law school, with a focus on intellectual property. The Summer Scholar experience has given him valuable insight into the development of intellectual property, he said, and the way research builds on what others have done. "You just want to find the answer," he said. That pursuit can blur the lines of who-did-what and who-gets-what when research leads to new technology or solutions or breakthroughs. Many subscribe to boundary-free, open-source approaches to research. But patents and defense of other property rights can require legal intervention. 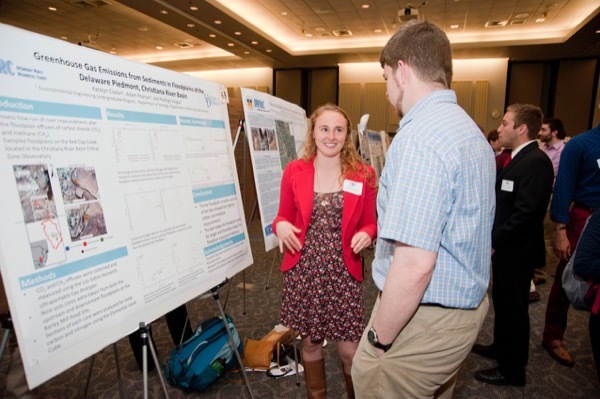 Dana Coyle, a junior exercise science major, worked with William Farquhar, professor and chair of the Department of Kinesiology and Applied Physiology, to study the impact of salt sensitivity on the body's ability to regulate blood pressure and heart rate. "I've always been interested in research," she said, "and when Dr. Farquhar did a presentation in one of my classes it piqued my interest." Coyle said her team could not reach conclusions on the significance of salt sensitivity on regulation of blood pressure and heart rate. Age tends to increase sensitivity, she said, and they could not "tease out" the aging factor to focus only on the sensitivity. Research often leads to more questions and "we just don't know" answers. Coyle said she would recommend the Summer Scholars experience to any student considering it. "You'll learn even more than in class but in a hands-on manner, and you'll never forget it," she said. Studying the brain's ability to identify objects in a rapidly changing context produced interesting results for Daniel Charytonowicz, a biomedical engineering student who worked with James Hoffman, professor of psychological and brain sciences. Using electrical measures of brain activity, Charytonowicz said the research team found some quirky phenomena. If you show a person a picture of a tractor and another picture 100 milliseconds later, the person will have no trouble seeing both images. But longer intervals between subsequent images somehow made it more difficult for a person to process the images. The phenomenon decreased if the images were complex scenes instead of simple shapes, he said. The work offers insight into how people cope with various kinds of data and how visual cues are processed by the brain. Charytonowicz said he loves the work and plans to return as a Summer Scholar this year. "I can't get enough of it," he said. "And I just love the support the whole University system gives. It is structured to help you succeed. I hope they keep promoting it and putting more money into it. There is so much opportunity for people to get involved and have a meaningful impact." Scott's work in Epps' laboratory explores ways to use nanotemplates to increase processing power and improve other features of electronic devices. Using nanotemplates makes it possible to expand capacity without expanding bulk, he said, an important feature as devices continue to shrink. The circuitry could be etched into thin polymer films and aligned as desired, he said. He showed how the letters "UD" had been etched into one model to illustrate the custom possibilities. "We're looking at many properties of these films," he said. "Tech is everything today." Kevin Bichoupan, a chemical and biomolecular engineering major, works with Joshua Zide, professor of materials science and engineering, in a project that makes nanocomposites for use in semiconductors. The process has allowed them to characterize and investigate new materials, he said. But the collaborative investigative work does much more for these young researchers. "This is a different type of learning," Bichoupan said. "In classes, this is the information you have to know. In research, we don't know. You're building off previous knowledge rather than learning about stuff that's already been done. And that's a powerful magnet for inquiring minds.